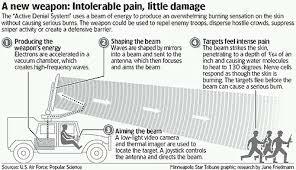 Military Convoy With Microwave Weapons Seen In Jade Helm 15 Permissive Nevada Provides More Evidence Of Massive Civil Unrest Preparation In America! Military Convoy With Microwave Weapons Seen In Jade Helm 15 'Permissive' Nevada Provides More Evidence Of Massive Civil Unrest Preparation In America! EDIT NOTE: As many commenters have pointed out in the comment section below, the units seen in these pictures are used as communications satellites. ANP was informed that they are able to be modified but after communicating with several different members of the US military we have NOT been able to confirm our source info via anybody else we've communicated with. The overall point of the story, however, remains the same, the US govt and US military are preparing for something huge in America. An All News Pipeline reader has emailed us the photograph above as well as the 1st video below which show a US military convoy with microwave weapons units taking a break while heading west on I-80 near Reno, Nevada. These units are used by the military as a non-lethal method of crowd control according to Extreme Tech, causing a tremendous amount of pain to those who the weapon is used against and making the skin burn' from the inside out, though said to cause no permanent injuries. This is just the latest sighting by everyday Americans across the country that provides us with more proof of huge preparation for some kind of an 'event' by the US military that looks more and more as being preparation for crowd control and civil unrest in America for when the economy completes its' tumble, leaving the US a 3rd world nation. Called an 'active denial system', these weapons can be mounted on top of vehicles or used as stand-alone units with their own generators on wheels as seen in the picture above and video below. Sending a non-lethal millimeter-wave electromagnetic energy beam at 'attackers', the energy beams penetrate skin up to 1/64 of an inch deep and cause a sensation that is similar to one being on fire - a two-second energy burst can heat a humans skin up to 130 degrees, causing anyone within its vicinity to pull away by reflex. These weapons can also be set to kill and work much like a microwave oven, with human beings being cooked rather than popcorn and pizza. Much more below. 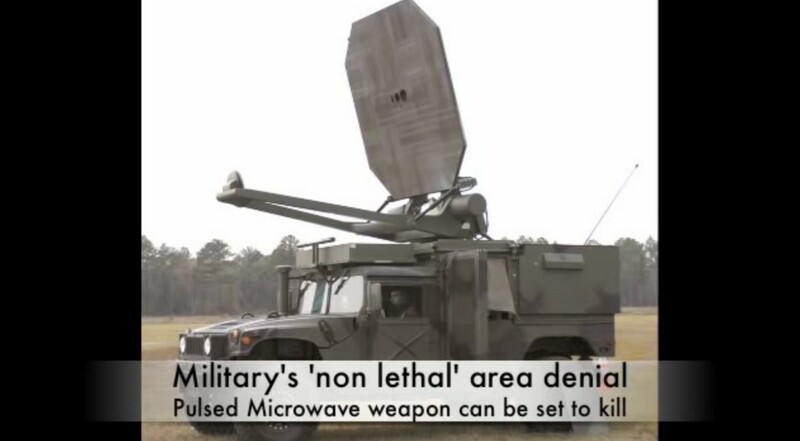 Like a kid playing a video game, the next video below shows us one of these microwave weapons systems in action with role players acting as rioters with govt agents working the joystick - the purpose of these weapons is painfully clear. The human targets allow themselves to be 'cooked'. After watching this video you can get an idea of how effective these weapons will be in dealing with civil unrest and the rioting hungry. 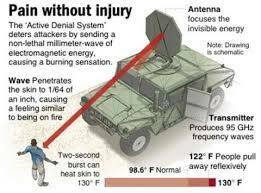 If you think that these weapons really cause 'little damage', you'll need to watch the next video below in which we see evidence that microwave weapons were used in Iraq on Iraqi soldiers who were literally cooked to death by them. Let's all hope they don't 'accidentally' turn up the power or this could be all of us in 3rd world America.